We came to the bushland today to look for the endangered Graceful Sun Moth. 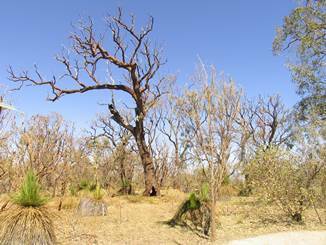 However, the storm on Monday evening has had a tremendous impact on the bushland. The upper canopy of the bushland has been stripped off the trees. 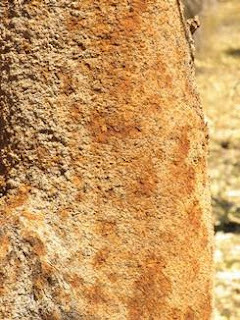 Most Banksias and Casuarinas have very few leaves left. 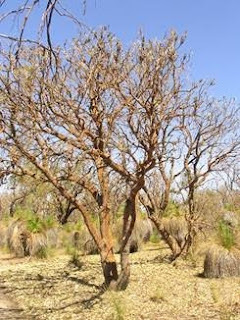 The Jarrahs have a few more leaves, but many of those leaves are damaged, so the canopy looks a little like it might after a fire. 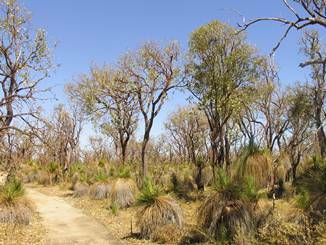 The middle storey shrubs have partly disappeared, giving the bushland a very open look. The ground covers, grasses, and sedges have been pulverised. Many of the Jacksonia serecia look dead. The sedges and lomandras are not too bad. The only green in the bushland comes from the somewhat shortened leaves of the grass trees. The banksias have been hit really hard. Most of their leaves have gone. The bark of the Banksias bears the marks of the hail stones which left orange scars on the grey bark. The bushland is almost silent. Few birds can be heard, or seen. Even the Rainbow Lorrikeets have gone. I heard a few Robins in amongst the canopy of one of the Eucalypts that seemed to have escaped much of the damage.